View More In Pond Foggers. What this pond fogger does is to vaporize the water in your pond and turn it into mist above the water. This effect will accentuate the light on your pond, creating a picture perfect scene. 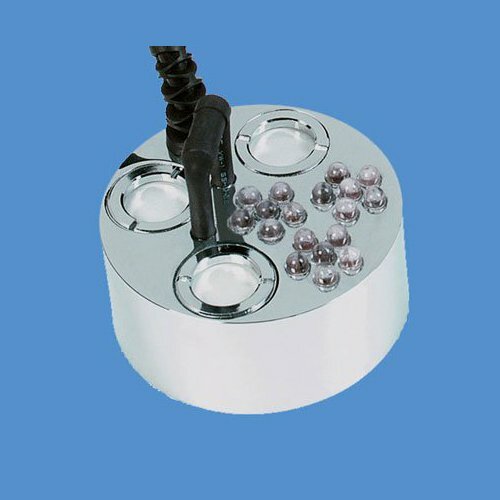 This pond fogger is a great accessory especially for outdoor parties or simply when you want to have a romantic or relaxing evening. Since this makes use of ultrasonic sound waves to create the mist, you can use this pond fogger even if your pond has fishes. It doesn't make use of dry ice either, although it creates that kind of effect! Our pond foggers are like no other. Emitting a magical, dry ice-like fog in seconds, our pond foggers come with LED Lights. These pond foggers will dazzle your guests. Using ultra-sonic sound waves - no chemicals - fish safe - with multiple openings, it delivers 3-5 times more fog than our single head foggers.